This was a very popular boat in the Carver fleet for many years. Her spacious condo-style interior with two wraparound seating areas in the salon provides the owner and guests with as much space you will see in most 50 foot yachts! The interior is all on one level! This makes it easy on the knees getting around the boat. The fully equipped galley is forward to port with the head located across. The head has a separate stall shower and can be accessed from the salon and the master stateroom in the bow. The forward stateroom can be closed off the a hardwood door. This stateroom is quite large and has lots of storage. The flybridge has only four steps from the cockpit area. The bridge has seating for 10 adults and there is a walk-thru from the bridge to the foredeck. THIS BOAT CAN BE AND IS VERY EASY TO OPERATE. The engines are Twin 7.4L 310hp Volvo Penta engines that are freshwater cooled. West Florida Yachts would love to guide you through a personal showing of this 38' Carver Santego 2001. 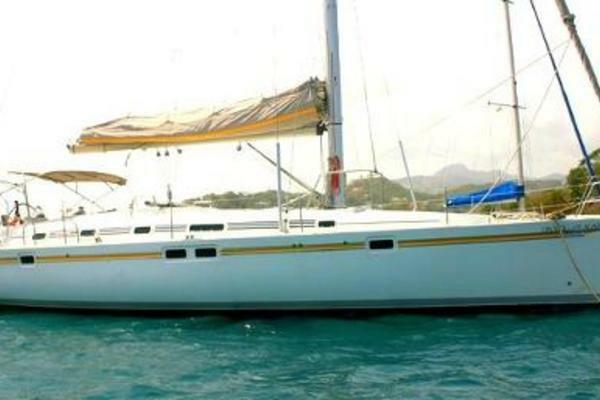 This yacht for sale is located in League City, Texas and priced at $74,900. For a showing please contact us by filling out the form on this page and we will get back to you shortly! Topside, the Carver 380 Santego has direct access to the foredeck with her convenient walk-through feature. She also has walk-around side decks, a command bridge with a double-sided helm seat, snap in carpeting, bimini top with full sided enclosures and a swim platform with integrated storage . Below deck, the 380 Santego's interior offers spacious, open-concept styling that provides sleeping room for four to six. There's an island berth in the master stateroom and a wrap-around dinette which converts to a double berth. Features a fully equipped galley with stainless steel sink, built in coffee maker, 2 burner stove, microwave and full sized refrigerator freezer, entertainment center, head compartment with Vacuflush and shower stall. Full of comfort inside with 2 zone air conditioning and heat, and carpeting throughout the interior are just a few more of her standard features. he entire interior cabin of this vessel is on a single-level and is very bright and open. There is a six person settee immediately to starboard that converts to sleep two adults and closes off from the remaining interior with a privacy curtain. A dinette area is found across to port and also converts to sleep two adults for overnight accommodations. The galley is positioned forward and along the port side of the salon with a wet bar that offers a cocktail sink, glass storage and cabinet space. The master stateroom is situated completely forward in the vessel and closes off from the rest of the interior with a wooded privacy door. The area has private access to the head compartment and features an island double bed positioned along the centerline. Boarding onto the large swim platform are steps into the cockpit on either side with stainless steel handrails. The swim platform also has two spacious fender storage compartments, fold-out swim ladder, hot/cold hand-held shower, and non-skid decking. The spacious self-bailing cockpit is arranged with a 5-person bench seat aft, flying bridge access to port, engine room access by way of removable hatches in the sole, and sliding glass door access to the main cabin area. The 380 Santego is a great meeting place for family and friends. Its spacious, open single-level cabin is absolutely the best solution for entertaining larger-than-usual groups. A sliding door leading to the roomy cockpit, which features a 5'10" lounge, provides even more space. The transom platform features integrated storage and ladder. The spacious flybridge provides convenient walk-through access to the foredeck, abundant seating including a double-wide helm seat, forward bench seat, plus port and starboard lounges. Belowdecks, the forward stateroom features a double island berth and private access to the head compartment. The galley offers an electric stove, stainless-steel sink, microwave and refrigerator/freezer.